rob mclennan & Susan Newlove take 2, originally uploaded by johnwmacdonald. This my 2nd annual-Newlove-toasting-mclennan-photo. The last time I saw these two together with a beverage was last August at rob's farewell party held at the Carleton Tavern 25 August 2007. This occasion marked the launch of rob's book Ottawa: The Unknown City published by Arsenal Pulp Press. 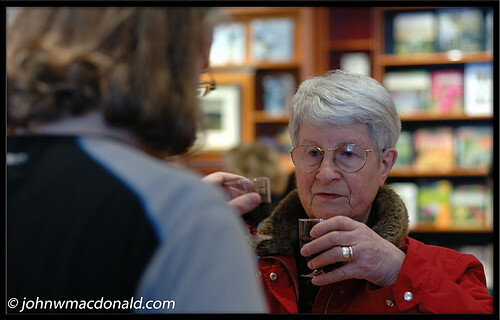 This event was also a celebration of mclennan's birthday today and it took place at Nicholas Hoare Books.